Jill Satterfield leads a monthly series of mindfulness and meditation sessions at BAMPFA. Cookies, cakes, and candies, oh my! Stand out from the crowd with a healthier holiday gift or dessert this year. Family and friends will appreciate (and devour) these healthier treats. All new ideas for the 2016 holiday season! Demonstration, recipes, and samples provided. Mark Morris Dance Group performs The Hard Nut Friday–Sunday, December 15–24, 2017 in Zellerbach Hall. Forever young-at-heart filmmaker (and French New Wave legend) Agnès Varda teams up with hipster artist JR on a road trip across rural France. A first-rate achievement in Vardas brilliant career. The Hall will be open for Members and their guests from 5:30 to 7:00 p.m. on December 17 for a holiday party. Build and test your own creations in Design Quest ​and enjoy special programming designed just for you. Earn tickets as you participate in activities so that you will be entered into a drawing for cool science prizes. Advanced online RSVP required. RSVP info: RSVP online by December 17. A stunning variety of styles and techniques is on display in works by the new generation of Polish animated filmmakers, including Ewa Borysewicz, Anita Kwiatowska-Naqvi, Tomasz Siwinski, Piotr Szczepanowicz, and more. This session briefly covers the UC Berkeley specific radiation safety information you will need to start work.​ In addition, dosimeter will be issued, if required. Get inspired by artworks in To the Letter, then explore language and letterforms by making mixed-media collages of your own. Biologically plausible deep learning for recurrent spiking neural networks. From puppets to epics, this program of recent animation from Poland features Academy Award winners and festival hits by Suzie Templeton, Kamil Polak, and others. 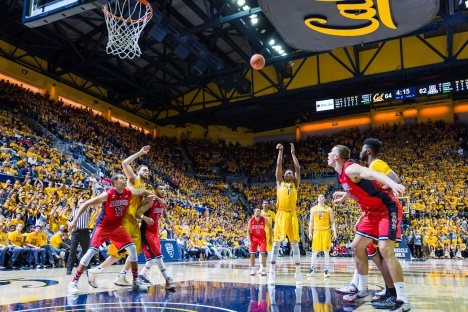 Cal Men's Basketball hosts Portland State at Haas Pavilion. With the return of the sun comes a promise from Nature of renewal and growth. Attune with the natural slow, calm, inward energy of the Winter Solstice during this unique concert with live meditative sounds of quartz crystal singing bowls and finely tuned gongs within a grove of redwoods. This series challenges the notion that science and politics should not mix. Building on the March for Science and the People's Climate March, we'll discuss how research in the public interest can make an impact in a political environment dominated by corporate interests, from the major parties to the media. Reha Erdems innovative group portrait of the inhabitants of an apartment building in Istanbul serves as a comic exploration of what it means to be human. Clint Eastwoods Western opus chronicles a retired, reformed gunman roped back into action by a much younger (and dumber) man. A tense, hard-edged, superbly dramatic yarn (Todd McCarthy, Variety). The Garden will close early at 2pm today, with last Garden entrance at 1:30pm. Akira Kurosawas Noh-influenced version of Macbeth is the most brilliant and original attempt ever made to put Shakespeare on screen (Time). The towering Toshiro Mifune stars. Joan Crawford won an Oscar for her driven performance in this noir melodrama that exposed the nightmare side of upward mobility and domestic virtue. This investigation of the editorial process behind Parks's photo-essay "Harlem Gang Leader" reveals unspoken conflicts between photographer, editor, subject, and truth. Discover the singular vision of a Berkeley-born artist whose paintings explore both exterior and interior landscapes. Chen Hongshou is a major figure in Chinese art of the late Ming and early Qing dynasties. This exhibition explores his visually compelling work and his response to the turmoil of his times. De Jesus's memorial portraits honor artists, writers, and diverse cultural figures, testifying to the fact that each life is valuable and worthy of recognition. This presentation showcases exquisite examples of Buddhist art from the Himalayan region. Commissioned for BAMPFAs outdoor screen, Kwons imaginative digital animation evokes a woman who transformed her apartment into an aviary. from their humor magazines and other publications. This exhibition crosses cultures and centuries to bring together works that activate the expressive and aesthetic potential of letters and words.